So… if you haven’t heard already, there is a lot of hype about this little bag! I had so much fun making this bag and especially loved brushing up on some of the best bag making tips I’ve seen! They are all posted on Annie’s blog. If you have never made one of Annie’s patterns try out this one. Then go crazy with the rest of them. 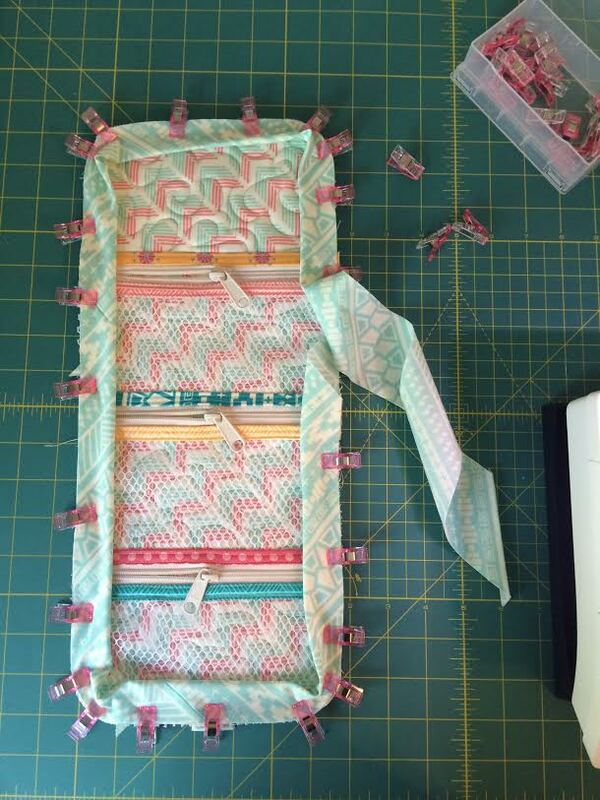 The tips presented in her blog series will help you become a #patternsbyannie master! Pictured above are some of the tools I used while making the Stash and Dash bag. These are bag making necessities in my opinion. I wouldn’t be without them while making a bag. I wanted to make a patchwork Stash and Dash, so I gathered some lovely Amy Butler Violette fabrics scraps I had laying around. I cut 2.5” squares and pieced them together. Then quilted lines a 1/4” away from each seam through the layers of lining fabric and soft and stable. I love how the quilting turned out, and I especially love the colorful patchwork. As I started thinking about the next Stash and Dash Bag I would make I remembered I have bunches of quilted Soft and Stable scraps left from previous projects. SO, I just grabbed a pre quilted piece of Soft and Stable out of my selection, and came up with this fun combination. I used some fabric I had left over from a bag I had made for Sherri and Chelsi out of there new collection Bright Sun for Quilt Market. My quilted fabric wasn’t quite big enough so I just adjusted the size! It’s a Mini Stash and Dash. AND I LOVE IT. I really love how the Mini turned out! I think i’m addicted to these bags! So now… Here’s your opportunity to win a Stash and Dash Finishing Kit for yourself. Leave a comment below on what you would store in your Stash and Dash bag and you will be entered to WIN! Winner will be selected Monday August 24! As always thanks for stoping by! UPDATE! The winner is Denise, Congratulations! Thank you all for stopping by and leaving your comments! I think I would probably make one for my daughter to take to college for makeup and such. I might have to use the laminate on the inside so it's easier to keep clean! My first thought was to use this for small jewelry, going on a trip soon and this looks perfect. I might use laminate on this. Stash and Dash is so cute, I'm sure there are endless ways to use this. My granddaughter began her freshman year at college, she'd probably like this too. I'd use this bag on my personal items, notions and supplies for projects taken with me during trips or to classes or to sewing nights with friends! I'd definitely refrain from putting make-up, goodies or crayons in something so cherished! So I don't know how to sign in using my phone!! Headed to Vegas for my 35th birthday and I need this to store toileries in!! I am making some more for my nieces who are in college for first aid/medical bags! You know, band aids, Tylenol, neosporin, etc. Great bags! I want to make one for my middle schooler for her supplies…pens, pencils, highlighters, Chapstick. I think they are fabulous! I'll be making these for a camping trip next year! I'm thinking it would be a great place to store all my pens & markers. Thanks for the giveaway! I think it would be perfect for taking notions with me. Much smaller than the big plastic tub I use now! I would have all my tools for hand sewing. It would be perfect. Have just bought the fabric to make it. I am thinking my first one would carry my thumb drives, maybe external hard-drive and leads as well as stationery. I would then have it altogether in my work bag. I might use some of the great periodic table or science glass wear fabric I found recently – I am a science teacher. I have already made two Stash and Dash. I especially enjoyed learning how to use a stiletto. The next one I make Is going to make to have vinyl pockets, instead of mesh, and I plan to store my double pointed knitting needles in it. What a lovely bag. I would store my English paper Hexis in it with needle and thread. Easy to take with me when I go out. I would use it to organize first aid supplies and medicine for travel. This would make a great travel bag for my jewelry!! So cute! I would use it for hand sewing tools to take to a weekly gathering of quilters, knitters, and embroiderers. With the Stash and Dash there would be no excuse for a growing collection of UFOs! I would make for my daughter. I haven't even made one yet, and I already want to make two! One for my son's little cars, dinosaurs and other little toys that we take with us to keep him busy! And one to keep in my diaper bag full of "mom essentials, so I'll be prepared for anything a toddler can throw at me…plus, chocolate. 🙂 Your bags turned out so cute, of course! I would keep my makeup in the Stash and Dash. It would be especially great for travelling!! I just started getting back into crocheting and need something to keep all the hooks, etc. organized, so that's what I'd use the Stash and Dash for. Thanks for the sweet giveaway! Love your mini version as well as the original..sew cute!!! Beautiful work, I can see so many uses for this bag. Goodness, first I would make one and supply it with first aid items to keep in the car. Next, I would make one for grab and go projects like hand applique, hexies, etc. I have made my first one and plan to use it for my knitting and sewing supplies when I am camping. I am already planning the next one! Oh, my the possibilities are endless, it would be great for travel, for jewelry, make-up. Or to take on your sewing retreats to hold your notions. Or, to hold your teas and sweeteners in your bag! Thanks am going to have to make some of these. One for my sewing supplies, one for jewelry, one for makeup, one for … I guess I will need to make a lot of them! So many possibilities! I would make back to school kits for my great nieces, grandma kits for my sisters, a craft organizer for me, and definitely a sewing kit for my daughter so she won't keep sending her mending all the way from California! I'm planning to make a Stash and Dash bag to match a Travel Essentials organizer for extra storage for travelling. Loved your blog post and Annie's pattern. I'm planning on using it for my hand sewing projects so when I'm going to the doctor's, traveling, etc., I can quickly grab it and go. Thanks so much! I have 2 teenage granddaughters. Need I say more??? I'd stash stitching supplies and even a small stitching project would probably fit! Sew cute! Can't to make one for myself. I will need more than one of these beauties! Great for travel…toiletries, make-up, jewelry. 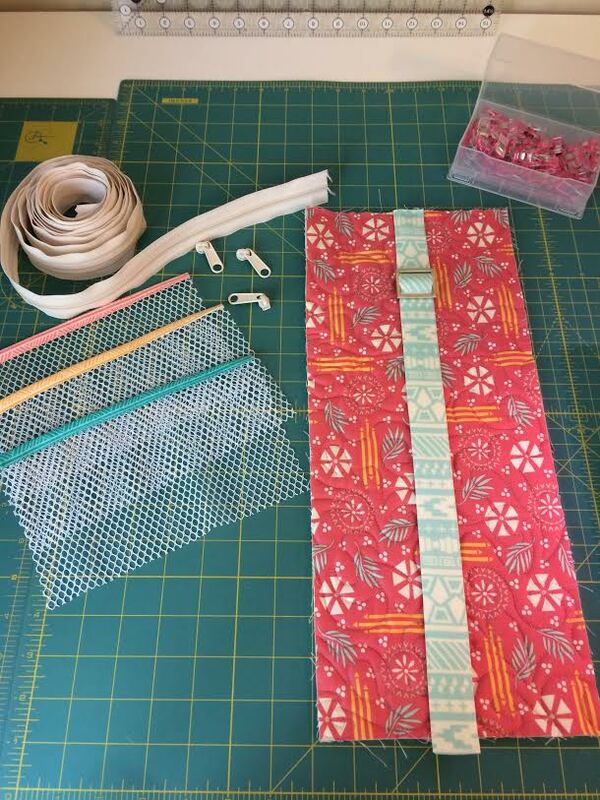 Quilt retreats…gadgets and tools that make projects so much easier to create. Organizer for my morning routines. I am sure I will find hundreds of uses. Love this bag. I would use it for, of course, hand sewing supplies. I'm currently making a 1/4 scrappy hexi paper piecing project so this would be perfect! Thanks for the chance to win! I love this project. Can't wait to try one for a gift. I've been wanting to try this bag! If love to store all of my sewing supplies in it when I go to a quilt retreat in the fall!! You are the winner!! Thank you for stopping by! If you could give me your email, I'll email you for your information and be thinking about which (zipper color / hardware color / mesh color) you'd like in your finishing kit! My mission is to empower women to create, connect, and discover themselves through sewing.